Africa Safaris offer travel to a wide range of exclusive, secluded wilderness areas in Africa with professional, knowledgeable Safari guides and skilled trackers. Our guided safaris cater for every need and comfort: we offer a choice of safaris with camping exclusively in tents; a combination of camping and lodge accommodation and safaris accommodated entirely in lodges. Our accommodation options are superb - even when you're camping it's hardly "roughing it". The basic facilities of private or ensuite w/c facilities are on hand in most safaris featured here. And if you have any doubt on the food available throughout the tour, you're in for a pleasant surprise - the food is sumptous Pan-African cuisine often with mouthwatering dessert options. 5. Safety and Comfort on Safari: We have hand-picked the very best locations and accommodation and we constantly monitor their standards and political safety of the regions being visited. 6. Our Commitment to Conservation: Together with our various partners we have worked with local governments, wildlife authorities and local communities. They are involved on an ongoing basis with conservation of the environment and wildlife in these regions, and through these partners we donate a portion of our guests' safari fee to the preservation of the African wilderness and the upliftment of local communities. In collaboration with these partners, we have exclusive camping rights in most wilderness campsites and ensure that we leave behind only the "lightest of footprints"
Levels of effort and participation vary between different itineraries. Adults and children over 5 years can participate in almost every guided safari, however they are not recommended for very young children due to the close encounters of the wildlife during walking and canoeing safaris. Children on such itineraries may stay back at the camp [upon prior arrangement only] with a babysitter. Senior Travelers over the age of 70 years are required to present a medical certificate from a doctor confirming fitness and health to take the tour at the time of booking. Please note that some of these safaris may involve vigorous or long hours of walking when exploring the game on foot, and often travelling in lightweight aircraft. Note: We are currently working on adding new photographs to better illustrate the accompanying itineraries in these pages. The Bush skills section is also under construction and will be up in a few days. Please do check back soon. About Botswana: Botswana is a land of wild beauty and stunning game reserves, a perfect setting to explore the vast untouched wilderness of Africa. Botswana's beautiful reserves and landscape has yet to be discovered by the masses of tourism that cloud the rest of the Sub-Saharan Africa. Why? Simply because of the remoteness of the region's attractions. From the subtropical wilderness of the Okavango Delta to Chobe National Park with its vast herds of elephant and the haunting, ethereal splendour of the Kalahari desert. The Botswana Classic Safari encompasses the highlights of Botswana and includes exploring the Okavango Delta by mokoro (dugout canoe) and game drives in Moremi and Chobe National Park. This 14 day camping safari is ideal for the younger traveller. This safari visits real African rural villages and you will get to meet the local villagers to learn about their culture and traditions, first-hand. An upscale, 13-day [in Namibia], exclusive, elegant, fully serviced camping & lodge safari. 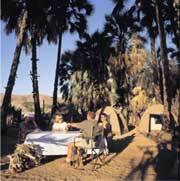 A 13 day serviced camping safari, taking in "Namibia off the beaten track". Explore the "Land God made in Anger"
An 11 day safari exploring the magnificent and unspoiled wilderness areas of Namibia. The highlights of this tour include game drives in Etosha, the pristine wilderness of Damaraland and the awe-inspiring sand dunes of the Namib Desert. Lands of fragile beauty - a must for birders and wildlife enthusiasts!